We'll the scientists on on of the shows calls Meldrum brave and takes courage and so on. If you were in a PhDs program and those instructors knew you were big on this subject it could hurt your chances. Regardless of that, just have a skeptic please offer what they think it would take to look fir something lost in woods and how many people are in any given period of time looking for bigfoot. We can safely say the thousands looking for the boy for nearly a week in the example in post #1 did not stumble across one. The same argument is in the General Discussion forum with lots of people claiming Bigfoot sightings in urban areas all the time. These are areas with loads of potential witnesses with recording devices at the ready and in use. These are areas where Bigfoot should be recorded on a regular basis just by accident. GoPro cameras in use everywhere, security cameras, phone cameras, people with camcorders, etc. I would ask, "How many people are actively searching for bigfoot?" I'm a skeptic looking for BF. Nothing so far, but I'm stepping up my efforts and we'll see. Do you think a long term project with many trail cams can be successful? And when you ask them and they tell you they've never found a single thing Bigfoot related, well, that's a cover-up. Loving the non answers we are getting here. Obvious avoidance of the real world example (and there are many) posted about looking for a lost kid, boyscout, and so on. The comedy tour continues but no examples from the skeptics. No real world numbers are even suggested. Since this is the PGF thread I take it many of you like me would make the assumption if bigfoot were to exist bluff creek type areas would be more likely. Put another way, bigfoot would be less likely to exist in urban areas. I am sure some will post examples of someone who claimed an urban area sighting but that is really a distraction from the main point. I would hope we can agree if bigfoot were to exist, he is less likely to be spotted in Times Square. So why is it a lost boy takes 1000's of people to find over 6 days in a small area? other reports of the incident stated they were searching only 2-3 mile radius. So many volunteers they had to turn people away. In spite of all of this those darn woods have been all searched out. That is the skeptical position. I am just trying to understand that limited thinking since it is not based on real world realities of searching from what I can tell so far. Certainly from these posts anyway. So why is it a lost boy takes 1000's of people to find over 6 days in a small area? As opposed to screaming at them, throwing rocks, chasing them, tearing search dogs in two, etc. 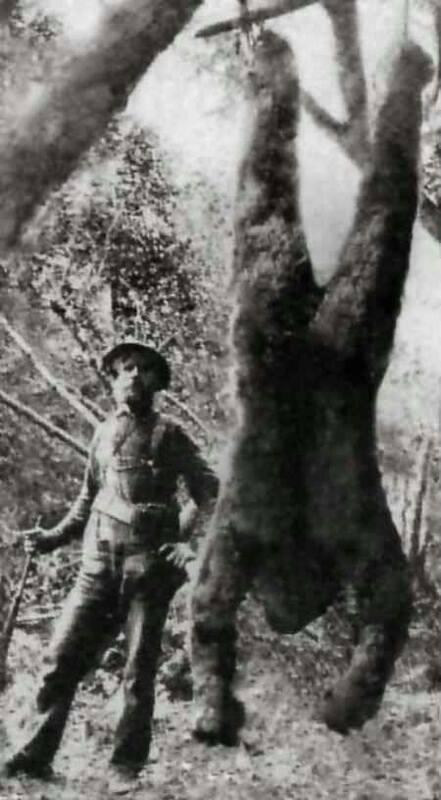 A species of giant bipedal apes living across North America acting as Bigfoot enthusiasts like to talk to each other about would have been one of the first things Europeans would have put a bullet in when they started nosing around. Thanks Kit, that is my point. Things that don't wish to be found or that are startled by human activity tend to be harder to find. So those things harder to find take more effort to find them don't you think? Hey Kit, is there a way you could somehow post the link you offered on that Carnivore Trail Camera thing. Looked pretty cool and relevant to this thread. I have some thoughts on that link you offered but it will get confusing referring to it between threads. If the rules allow could you post it here so we can discuss it? I'll post it up since I think I first linked to it on the forum elsewhere. Thanks Bipedailist. Looks like good discussion material along these lines. Thanks. When a full suite of evidence shows us that something is real, its absence from trail cameras - something that animals like coyotes have been shown to actively avoid on their territories - is a trivial thing that shouldn't affect the other evidence, as long as that evidence - like, you know, a movie of one - remains unexplained. No game cam photos does not say "those footprints are fake" or "those folks are affected by swamp gas, LSD, bad breakups, skunky Heineken, etc." To think otherwise is a significant failure of critical thinking. I assume most apes/ monkeys are still plant eaters vs meat eaters. 1- More numbers in that area of that animal. 2- More attracted to the bait with less competing bait in the area. While Monkey and such are seen on trail cameras, they are observed in areas that have a decent amount of monkeys actually living in the area. I image they are baited with fruit or whatever a monkey likes to eat. So you throw some meat out there and some animals come. Is this no different than the bears at Yellowstone or other parks coming to raid the garbage. They are practically trained. So you get it on camera. What does this prove again about all the animals who did not come to the trash to eat? Does this suggest only those bears who came to eat at the garbage are the only animals that are real? Can you provide supporting documentation that a severely autistic child was avoiding people who where searching for them? I'm unsure how you can make this statement. I would assume like you he was highly motivated to be found. Funny how no mention is made of the 1000's needed for such an effort. It might be because this real world example is just too perfect an illustration. I would not be surprised if the amount of people actively looking in the woods for this boy was more than the total looking for bigfoot in most of the United States. I ask the skeptics to offer me a number and the basis for it. Crickets. It is easy just to suggest, the lost boy was trying not to be found and gave no basis for it. One aspect of autism is what the CDC describes as "wandering." The persistent fixation in an autistic child's mind that they want to flee from people and will focus solely on that goal until they have attained it. The problem of autistic behaviour in missing persons cases is well documented. Not every lost person is trying to be found. Is bigfoot trying to be found? Would you say it took a little effort or a massive effort to find this child trying not to be found?